"We cannot overturn the land. We can only do our work, to the best of our ability, and accept the results in due course. The only hope we have is that our devotion to the religion might inspire more people and that more will follow us. Those in power might do so, or even everybody in the world, that would then be the same as overturning the land. Even though we did not do it ourselves, the results would be the same. And we could stay humble and not have to frustrate ourselves till death." - Buddhadasa Bhikkhu in "Eulogy for Our Mother: Reflections on Mother Who Has Passed Away" published in Phuttasatsana in August, 1948. Bangkok, Thailand -- We could consider ourselves lucky to have been born in this era of global chaos. So said Buddhadasa Bhikkhu 30 years back. The late reformist monk saw a parallel between the world at present and the time of Lord Buddha, more than two-and-a-half millennia ago, when humanity was beset (as now) by all sorts of ills. Suffering is not such a bad thing, Buddhadasa proposed, for it prompts us to seek the Truth, to end the malaise within and without. We can encounter suffering, "play" with it, challenge it. Only then will we be able to render the cycle of death and rebirth (samsara) totally meaningless. Indeed, the widely respected monk felt that the very first thing we should mock is ageing, one of the fundamental causes of human suffering. 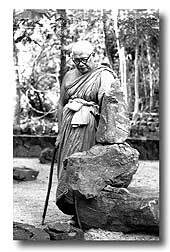 Buddhadasa was born on May 27 and some years before his departure from this world he initiated the practice of organising an "alternative birthday party" on that day at Suan Mokkh, the forest monastery he founded in Chaiya, his hometown in Surat Thani province. Monks and lay followers would join a mass, day-long fast, and the abbot himself would give an extended talk on some aspect of dharma. In 1976, at the height of the Cold War which saw most of the world, including Thailand, divided into communist and capitalist camps, Buddhadasa chose to celebrate his 70th birthday by talking about "the world that has gone awry". He analysed the causes, prescribed ways in which individuals could survive the turmoil and, even more significantly, urged proponents of all religions to come together and find ways to counter this global disarray. Three decades later, his message is no less relevant. Actually, the "mess" he was referring to back in 1976 - pollution, rampant homicide (he cited a statistic of 30 murders nationwide each day, including two in Bangkok), the rise of consumerism, failings in our educational and political systems plus ideological bi-polarity - now seems minuscule compared to the current state of affairs in the Kingdom. But the main culprit is still essentially the same: Human beings. The global crisis, Buddhadasa noted, originates in "the kitchen, the bedroom". Sensations, be they of the pleasurable kind or not, drive individual men and women to recklessly commit blunders time and time again, to the point where, as he prophesied, "a single person's lust could trigger a whole world war". "The world has become smaller, not unlike a jujube fruit [put-sa] on the palm of your hand," he continued. "It has 'shrunk' thanks to scientific advances. When problems arise in one country, they will inevitably spill over into another, and so on. There is no assembly of true representatives [of the people]; there is only a gathering of the selfish-minded who keep fighting one another. How, then, can you call for solidarity from the people?" Will we be able to survive the muddle? How? Interestingly, the accumulation of material goods by established religions reflects the level of decadence, Buddhadasa lamented. At any rate, he continued, spirituality remains the ultimate solution - as long as people know how to apply the "heart of their own religion rightly, adequately, and in a timely fashion". For Buddhists that means having Lord Buddha dwell within oneself at all times. There is no need, however, to carry Buddhist amulets around; to see the genuine Buddha, Buddhadasa declared, all one needs to do is to be aware of the laws of paticcasamuppada (dependent origination) and to stay mindful "as if we were in the centre of a snake's mouth but not succumbing to its venom". "We can cultivate dharma to be like our armour," he said. "Our minds won't be susceptible to the fangs of a world that has turned upside down. We won't have to cry or go without sleep. We won't laugh when we win something nor cry when we lose it. Our minds will be above loss and gain; they will transcend time, time that has become valuable because of our desires." While religious differences have been blamed in some quarters for the upsurge in armed conflict, acts of genocide and terrorism around the globe, Buddhadasa saw things in another way: The world, he said, is in need of as many different religions as possible. Some creeds may stress faith while the focus of others could be mental prowess, insight or wisdom. "That doesn't matter; as long as it keeps the world in a state of peace, it's all right. There must be enough [religions] to choose from, for there are many different kinds of people, different kinds of mentality." The far-sighted monk called for the creation of a "fundamentalist" movement within every religion - but he didn't mean the narrow, parochial type of fundamentalism that has been blamed for contributing to the so-called "clash of civilisations". If Lord Buddha were to return to this world, Buddhadasa once remarked, he probably wouldn't be able to recognise Buddhism in the form in which it is practised these days; the same could be said, too, of Jesus Christ and the Prophet Muhammed vis a vis the religions to which they gave rise. There must be a radical cleansing, Buddhadasa said, a stripping away of tumours, parasites and other unnecessary paraphernalia. Only then will we be able to see that all religions invariably teach their followers to abandon selfishness. The axiom, "To serve others is to serve God; to serve oneself is to serve Lust or Satan", applies equally to atheists as it does to those who believe in a Supreme Being, he declared. Thus the ultimate form of merit-making, Buddhadasa suggested, is to promote inter-faith understanding. "Building temples or churches has been proclaimed as charitable conduct. But I don't think it will bring as much merit as would making an effort to understand one another, to bridge the gaps [between different religions]; only then will the world survive." This article is based on a book whose title translates as "The World That Has Gone Awry - And How Can We Live in Such a World?". It contains reproductions of the actual notes Buddhadasa Bhikkhu made for that "age-mocking" birthday address on May 27, 1976, plus the full text of the long speech he gave on dharma at Wat Suan Mokkh that day. Published to mark the centenary of his birth (1906-2006), the book is one of the fruits of a year-long programme (see related story) to preserve the originals of his hand-written notes and to study his working methods more closely. How best to carry on Buddhadasa's mission? 'If dharma [morality] doesn't return, the world will head toward calamity." He didn't exactly shout it from the rooftops but right up to the very end of his life Buddhadasa Bhikku took every opportunity to repeat this warning. Thirteen years after his passing, the decline in public and private morality is more obvious and more poignant than ever. So, what lessons can we draw from the life's work of this highly respected Buddhist reformer and thinker? How best to carry on his mission? To mark the centenary of Buddhadasa's birth on May 27, a coalition of secular and religious organisations, including many former students of his, has planned a year-long programme of projects and events: Talks, reprints of his books and dharma tapes, a search for unpublished manuscripts of his, meditation camps for children and grown-ups, the setting up of a body to be called the Buddhadasa Institute, and at least one concert by musicians and artists who have been inspired by his teachings. This coalition has chosen a simple name for its ambitious programme - the Dhammaghosana (dharma-propagating) Network, the title of a series of books by Buddhadasa based on meticulous research he carried out into the original, Pali-language Tripitaka (Buddhist scriptures). "Buddhadasa never saw himself as someone special, as a historical figure, and yet he brought about several important changes that have surpassed the work of many big names," said Phra Phaisan Visalo, an adviser to the network. "When he founded [the forest monastery of] Suan Mokkh, he was only 26 and a junior, low-ranking monk. But he had what you could call 'the consciousness of a Buddhist'. He built Suan Mokkh from scratch with the help of a handful of people. It shows that even a few individuals - ordinary folk who make the fullest use of their brains and have hearts brimming with dharma - can initiate change." In a call similar to that made by Buddhadasa, Phra Phaisan urges each and every one of us to chip in and rebuild the moral fibre of our society and make morality more relevant to the modern world. In his opinion, holding dharma talks and repeating conventional rules on Buddhist morality don't go far enough. One could even say that the morality "camp" has failed to keep up with the new guises that evil has assumed in modern Thai society. "As long as it [Buddhism] is concerned only with the [literal upholding of] Five Precepts, it will remain out of touch, irrelevant, obsolete. It is dangerous that, nowadays, the devils can disguise themselves so cleverly that an immoral act can be viewed as not breaking the law [of the land], as something that is not totally uncommon - as justifiable, even."